I couldn’t believe my eyes. This afternoon, as I was relaxing in my back yard I glanced up and there they were. Look carefully and you will see them too; they’re so beautifully camouflaged that it’s hard to make them out. Can you see the purple bush in the background on the right side of the photo? A little to the left of that purple flower and a tiny bit upward you can see what I saw. Two tiny green finches sitting on the tomato plant stem. Wow; a rare sighting. we said to each other. Where did they come from? Could they have escaped from a neighbor’s home cage? Have they migrated here from a foreign rain forest where they were never before seen by humans? Neither of us had ever heard of green finches. You can barely make out their shape. I had to get this picture or nobody would believe me. So I tried to move nearer without scaring them away. I wanted to get a closer shot. Is this any clearer? 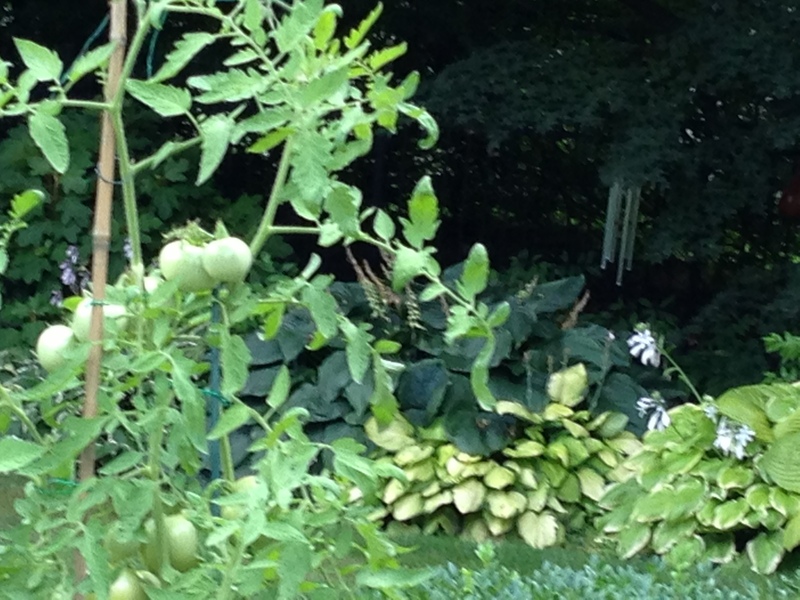 Can you see those little green birds on the tomato branch? They’re sitting on the right stem. This was intoxicating! So far I had gotten two photographs of them and they were not skittish; I had not frightened them away. I zoomed in so close that I saw that what looked like a purple bush were blooms from a hosta. And they weren’t purple; they were white. I’ll try a really close shot this time. So I did. As I got closer I discovered that Mother Nature had played her little joke on me. 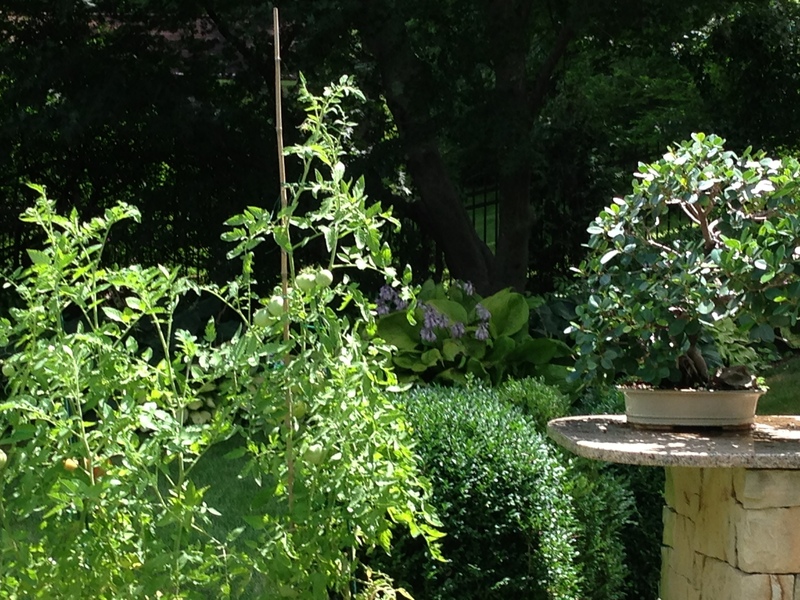 There were no green finches sitting on a tomato bush. All there was were two tomato leaves sticking straight up in the air, looking all the world like birds: instead of leaves. For weeks I have been reading articles and posts about the joys of spring: return of migrating birds, swelling of tree buds, lengthening of days. But spring means something else to our neighborhood: the return of the noisy, intrusive, outdoor maintenance workers and their noisy tools. The entire neighborhood is alive and buzzing with the irritating sounds of power mowers, leaf blowers and wood chippers. Early this morning, as we were eating breakfast, my husband noticed a man strolling in our back yard. We had never seen him before and didn’t know which work crew he represented. Could he be a tree specialist, here to trim trees that were damaged in October’s freak snowstorm? Or a gardener here to analyze the work he and his crew will need to accomplish this spring for the cleanup? Maybe he’s here to read the water meter. Maybe we should find out. Just a few nights ago our friends were burglarized while they were out celebrating the holiday. We should know who this stranger is who is walking around our back yard.